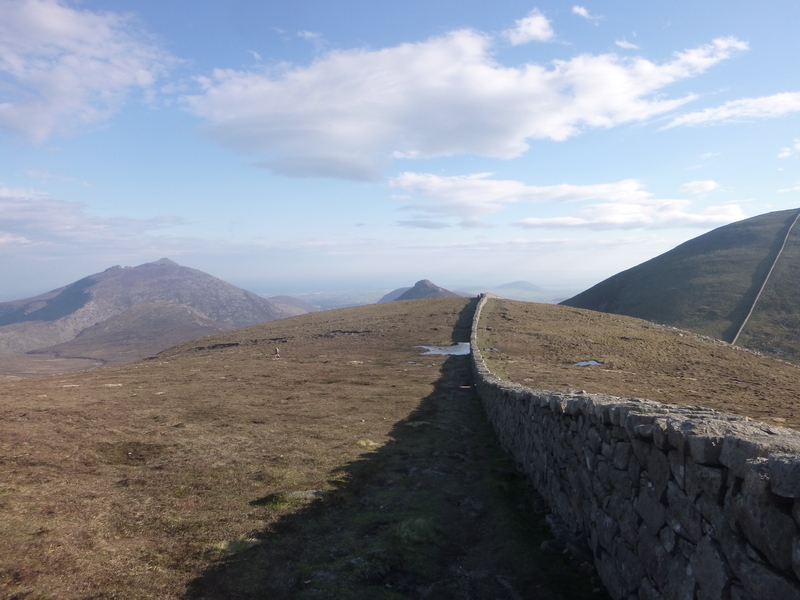 The Mourne Wall. 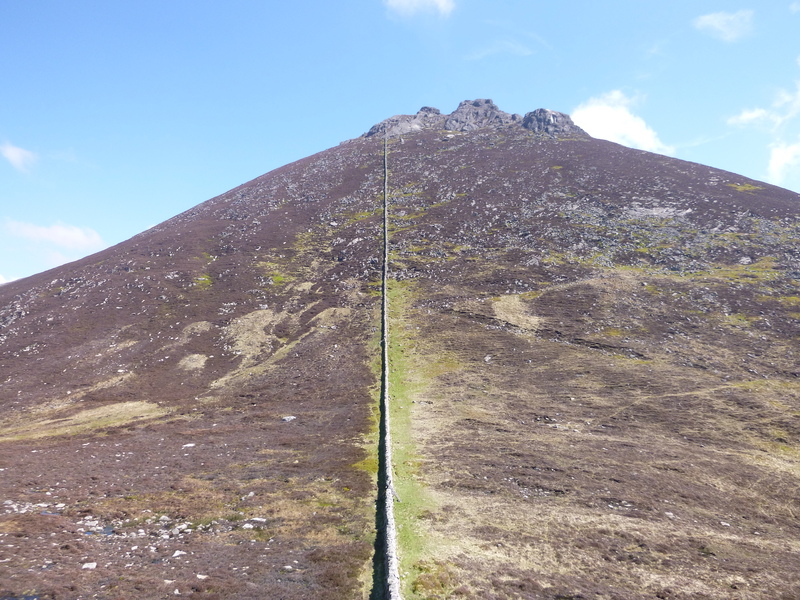 A 6ft tall, 100 year old, granite monster that spans 22 miles over exposed mountainous terrain and takes in over 15 summits in the Mourne Mountains in Northern Ireland. Oh, and it is also a stunning walking route. It was time to take on another challenge, something that would test our ability for strength, stamina and endurance. We knew that this route was going to be tough, but we didn’t think it would be this tough. Read more to find out how we got on! It’s going to be a warm one..
Picture the scene, opening the car door to be met with a warm heat, blue skies and a slight breeze. 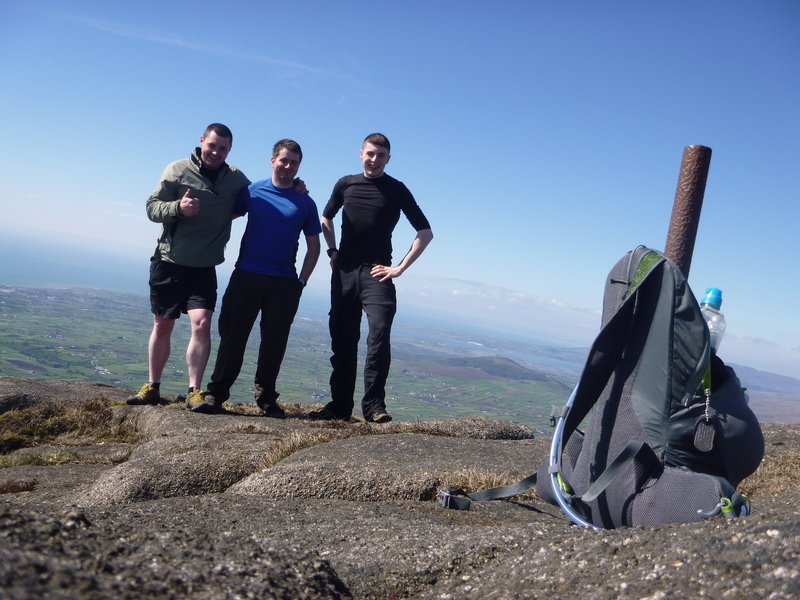 It was like a summers day (for weather in Northern Ireland it is as good as summer gets) and it had graced us on the day we were setting out to take on our toughest walk yet. We rolled up sleeves, clicked rucksack buckles and off we went. 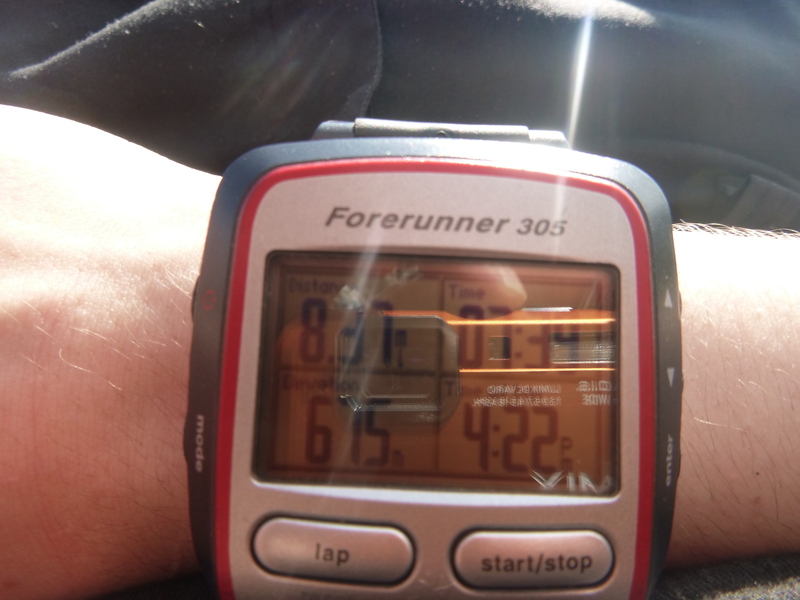 It was 9:30am*, and it was already hot. We had loaded up with 3 liters of water to get us through the first section of our route, until we could refill again. The track was empty and we had lots of ground to cover. 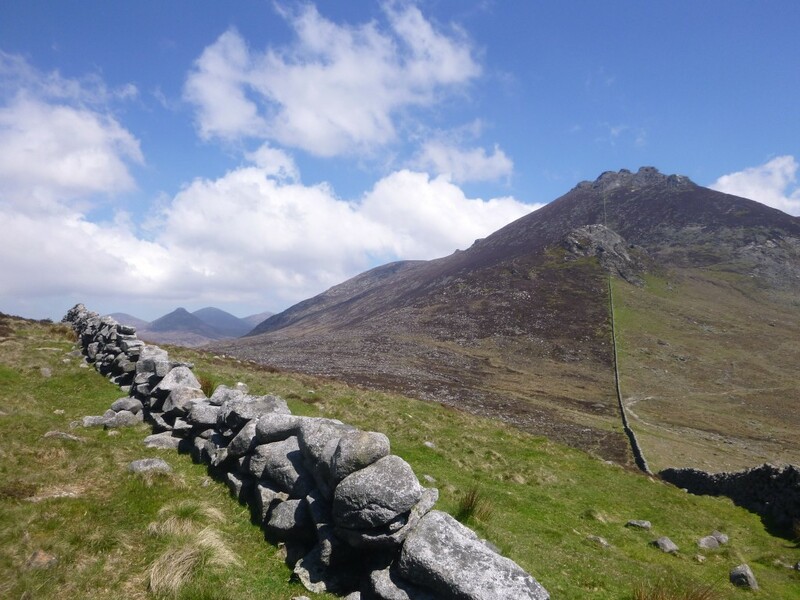 We walked along the wall and started our ascent on Slieve Binnian, we were travelling along the wall in a clockwise direction after starting from Carricklittle car park. It was a slow and steady plod up the mountain and because it was the start of the day, your legs are not quite yet warmed up and they can feel a little stiff. By following the wall you are not left with much navigational choice so in some situations you are led up a harder route and easier routes in others. With a bit of sweating and some more plodding we carried on step by step. At this point we had already got sleeves rolled up and the heat meant we found ourselves rolling up trousers legs too. We eventually made it to the summit of our first peak, 1:30hrs after starting. This time is borderline average possibly a bit slow, we took a few 10 minute breaks and could/would do it faster next time. The views from Slieve Binnian offer some of the best in the Mournes, and we had never seen them before. We spent about half an hour* on the summit tors taking photos and admiring the views before starting our descent. Note to self spend less time standing taking pictures and more time walking. 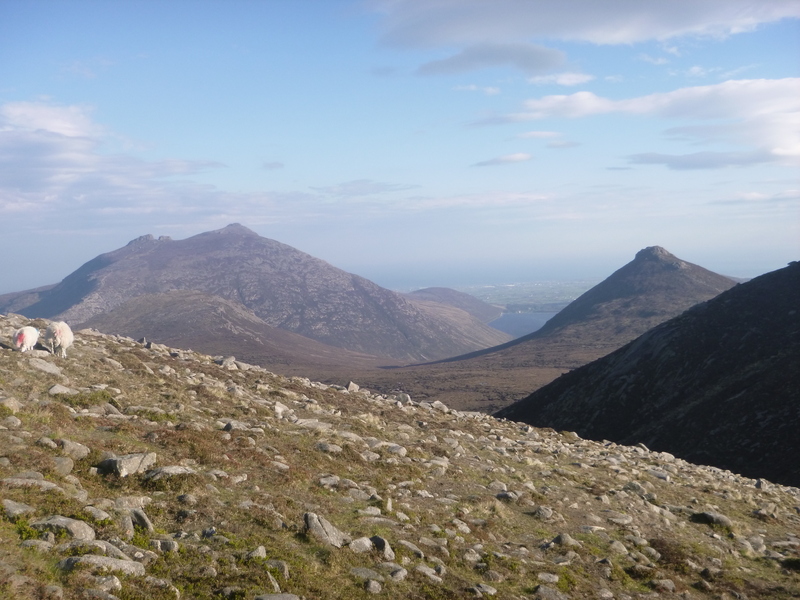 The descent from Slieve Binnian’s South-Western face is one of the steepest in the Mournes and makes for a slow careful descent, but I would still much rather go down it than up it, I can’t imagine the burning legs you would suffer climbing this side. We managed to descend safely and with only a few tumbles. After Slieve Binnian you drop onto a somewhat mini col and climb again onto Wee Binnian, which is essentially the little brother. It’s torrs are the same in appearance only not quite as hard to get to. At this point we were still feeling excited as to what lay ahead and the weather we were getting. Picking up the pace and passing over Moolieve we made our way to Silent Valley Reservoir where we would cross to get to Slievenaglogh. 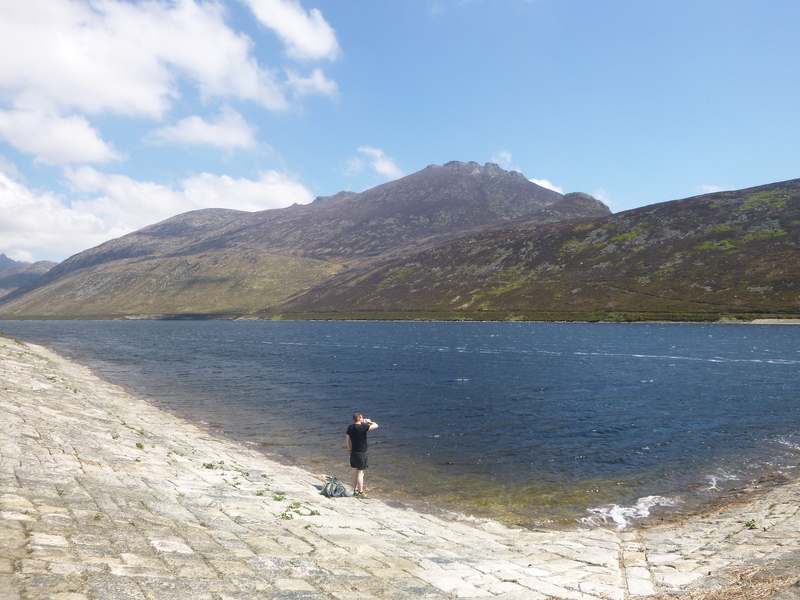 At Silent Valley we stopped to drink up on water as we could fill from here. We tried to drink a couple of liters, but it was harder than we thought, so I think we roughly took on 1.5L and a small bite to eat. We refilled our water containers form the reservoir and added some purification tablets (Just to be safe). We were passed by a torrent of school children who were out on a school trip and of course the innocently curious questions like “Are you camping?” were asked as they passed. Far from it kids, far from it. The next section was following along the wall towards Slievenaglogh and through the horrible bog ground that surrounds it. Out of the three of us we were all wearing different types of foot wear,I was in VivoBarefoot Breatho Trails, Rusty was wearing Innov8 Mudclaws and Ed was parading the Scarpa Cyclone GTX. The reason I’m telling you this is because we all ended up getting our feet wet walking through this bog, something to keep in mind. I ended up taking my socks off in order to keep them dry for the rest of the day, and while you might think this is a recipe for blisters, I didn’t get any thanks to Compeed patches. 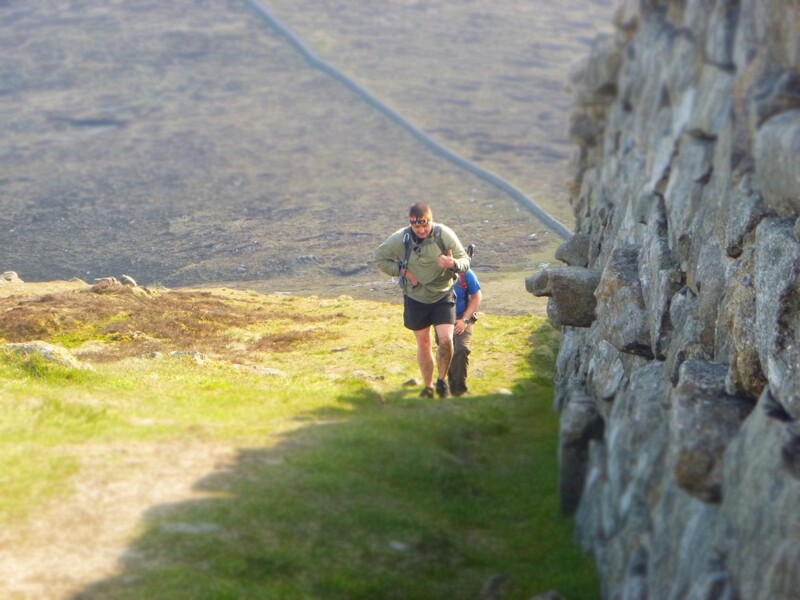 The steep climb to the top of Slievenaglogh is one of the toughest of the whole route, in my opinion. Although it is only 445m tall and you already start the climb after the bog at an altitude of 275m, it doesn’t leave that much to climb, but believe me, it is a tough one. 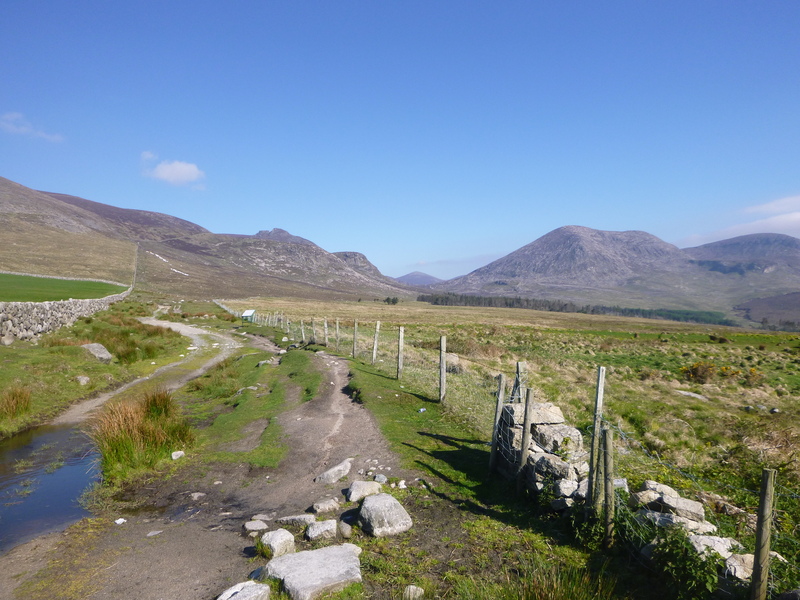 I believe the combination of the previous boggy section and the steep gradient makes it one of the toughest stretch of the whole walk, mainly because of the cramp you are likely to get after wading through bog and heading straight onto a steep climb. 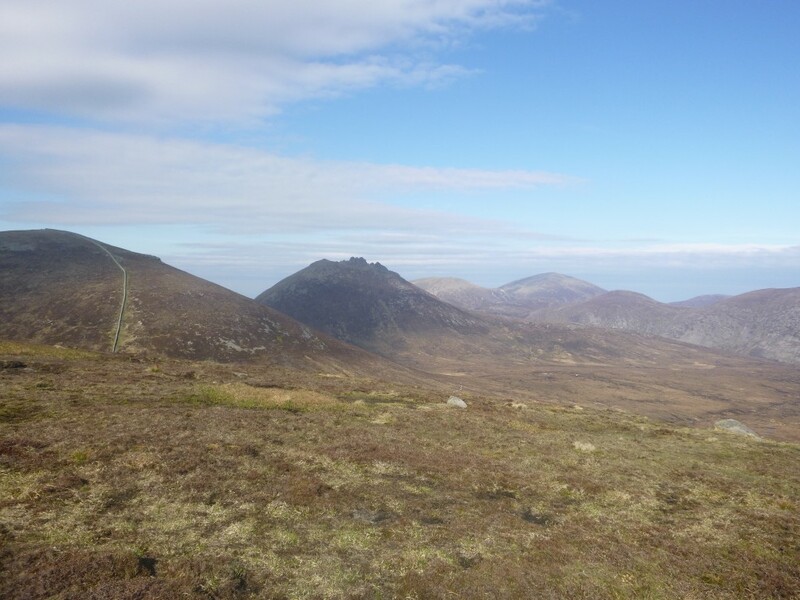 From Slievenaglogh we descended (slightly) quicker than we had on Binnian and crossed Bann’s road (It’s more a track) and headed towards Slieve Muck, which to be honest, is the last mountain you want to be tackling after the tiresome jaunt up Slievenaglogh. The heat was hottest at this point in the day and that only added to the challenge that lay ahead of us. Only one of us had ever climbed Slieve Muck before, but it didn’t take long to realise that it is call Slieve Muck for a reason. We encountered lots of muck, muck being a vague word. It was more like watery grass that is growing out of loose boggy soil that doesn’t smell the best. Our feet were wet once again. With sore legs and strong sun we struggled on upwards towards the summit. 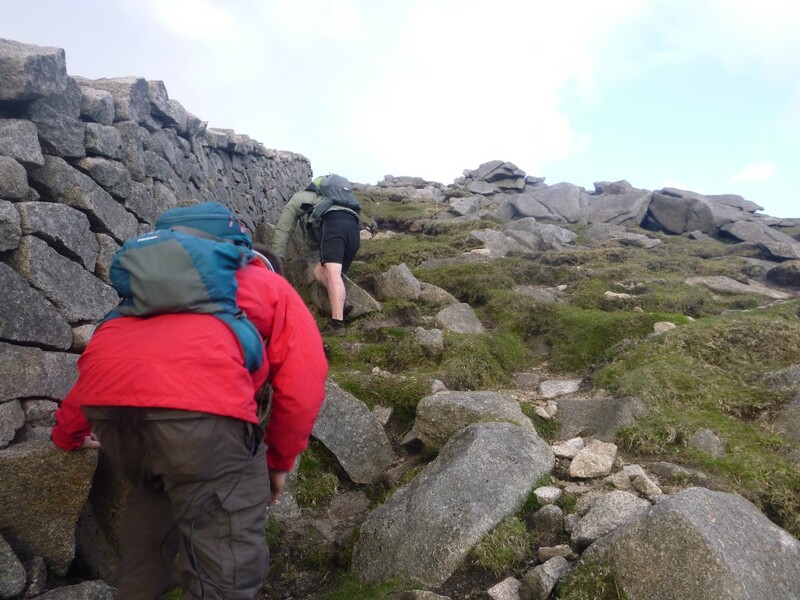 We tried a direct upwards route instead of detouring around and making a longer journey, which meant some hands on, grass scrambling like maneuvers. We finally reached the summit and sat down for a break. At this point we were 8 miles into the route and had another 14 to go. 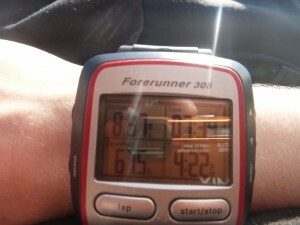 It had taken us over 7.5 hours, which put our pace around a slow 1Mph. If you spend less time on summits taking photos and set a quicker pace over the flats then this could be improved. Summit Slieve Muck marked a rough 1/3 point of our journey. From here the vast majority of ascent is complete and you have a more or less flat journey ahead of you, bar the 10 other mountains you have to climb of course. 1/3 down, 2/3 to go..
We soldiered on and started to rack up the miles a bit quicker now that we had a flat section to walk on. This section of the walk opens up some of the best views you will see on the walk and it was made even more special by the glorious weather we were graced with. 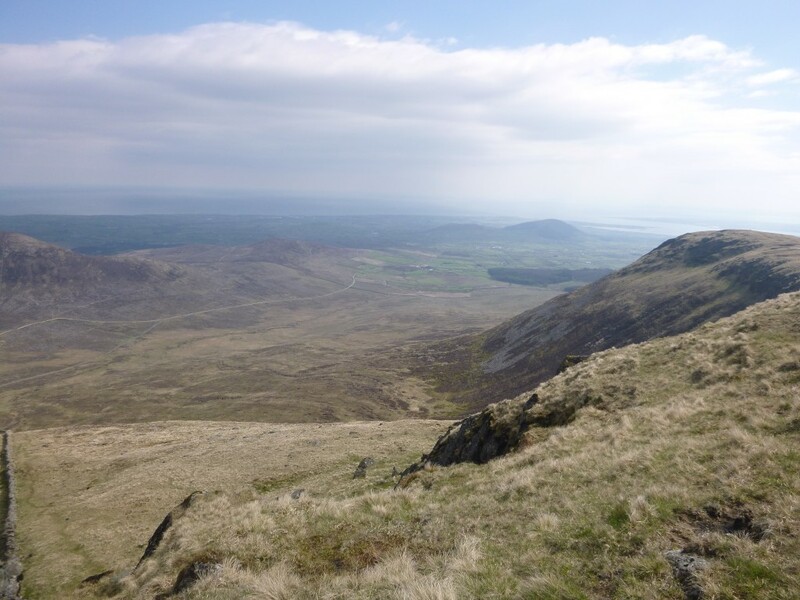 We traveled over Carn Mountain, with views of Loughshannagh and Doan, which were beautiful. We spent this section of the walk aimlessly following the wall while admiring the views and the time passed pretty quickly. 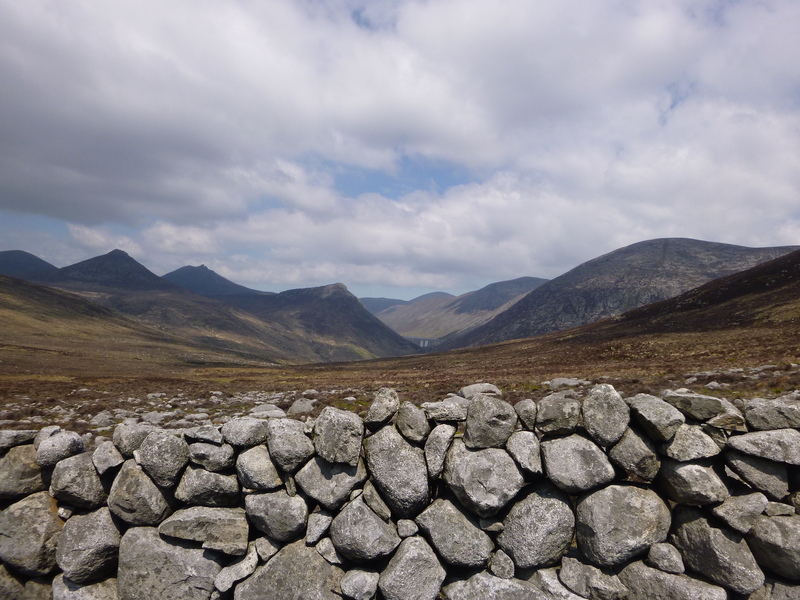 From here you can see all the way across tothe other side of the Mournes and such mountains as Bearnagh, Commedagh and Donard. After dipping up and down Slieve Loughshannagh we were faced with Slieve Meelbeg which is another steep climb. Some clouds had started to gather above us, which was a nice change from the glaring sun which we had been having all day. 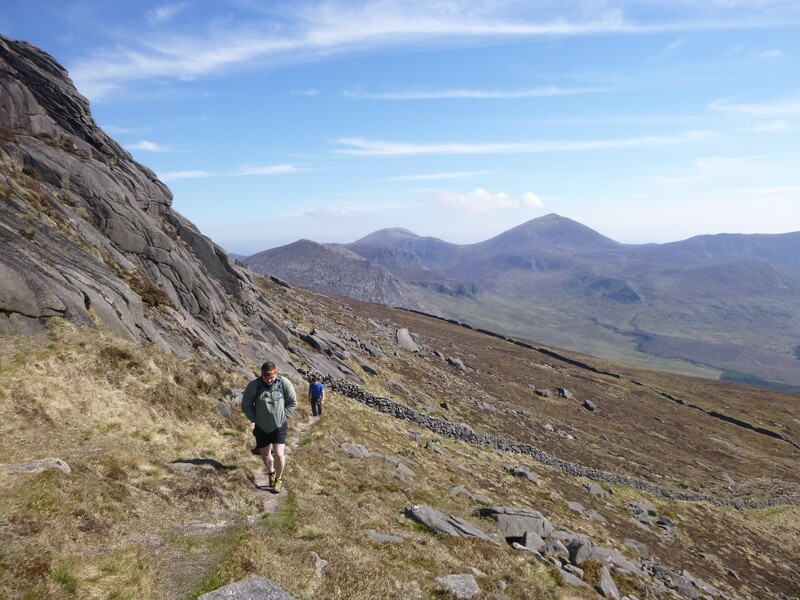 At this point in time jokes were made that someone should install an escalator in the Mournes! Talk about leave no trace. 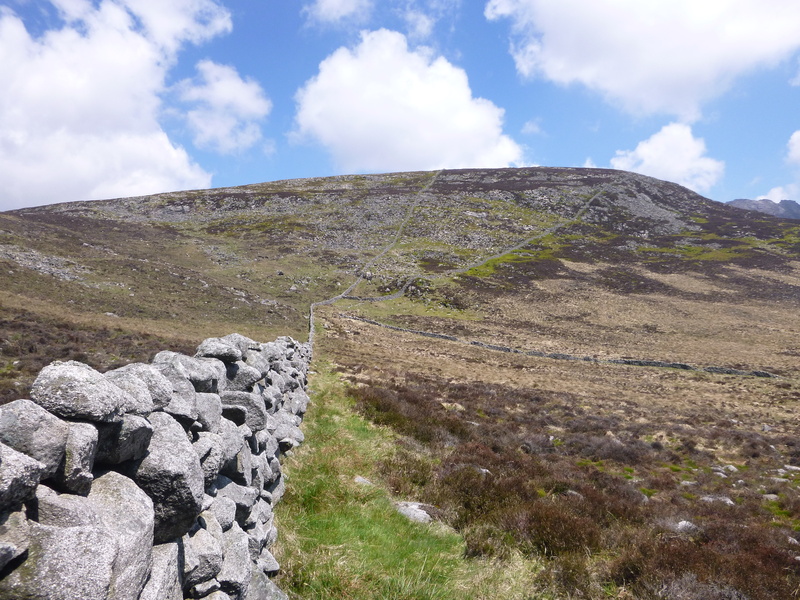 We walked in the shade for some time and soon we arrived at Slieve Meelmore, where we followed the wall as usual. The sheep didn’t like the look of us and soon walked off to another grazing/sun bathing spot. Looking back at Slieve Meelbeg. We finally made it to Meelmore and were simply taken back by the shape of Slieve Bearnagh, it’s steep face and rocky crust didn’t look too inviting. We didn’t get the chance to fully appreciate each mountain as all we saw it as was another obstacle to overcome, but this is why the walk is a challenge. If you are looking to spend more leisurely time then doing it over two days would provide this opportunity. 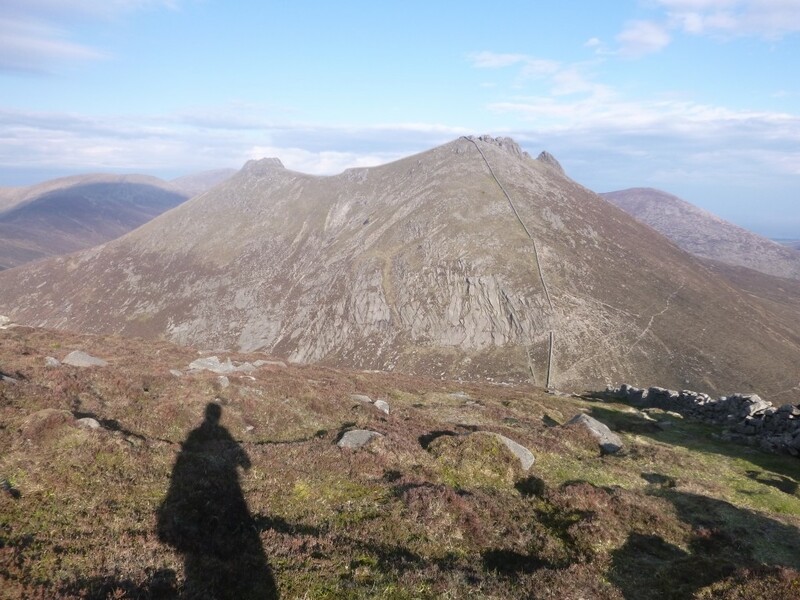 After descending and reaching the stile between the two mounds we we took on more food and water and stretched our neck looking at the West face of Slieve Bearnagh, which was pretty intimidating I will admit. It is so steep in sections that the wall breaks due to the steepness and starts again 20 meters upward. With some food in us and water on board we continued onward and upward. We soon found ourselves needing all four limbs to complete this scramble and stabilize from the strong gusts in our exposed condition. We grabbed hold of rocks, grass and just about anything to try and feel a bit more secure. With more of the reoccurring theme of slowly plodding upwards, we managed to make it to the top. With that we had our first encounter with another human that day, a hiker who was trying to find a good spot to have a pee. Glad we bumped into him sooner than later. As we summited Slieve Bearnagh the evening light was starting to spread over the mountains casting a warm orange hue which was a delight to walk in. With the evening light also came the realisation that we would more than likely end up walking a good bit in the dark, the outcome from the mistake of not leaving earlier in the day. An increase in speed and we descended Bearnagh and crossed Hares Gap. 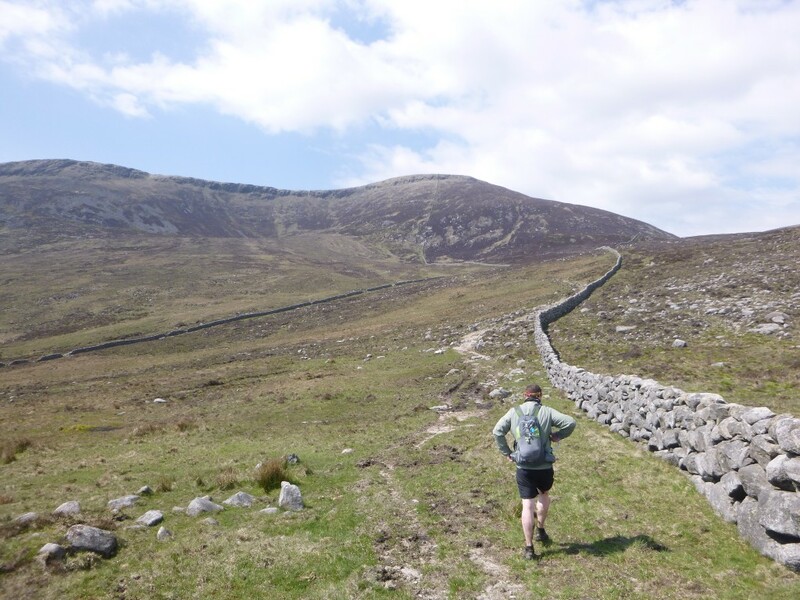 Hares Gap was the final low point before one last big push along Slievenaglogh, Slieve Corragh, Slieve Commedagh and finally Slieve Donard. Sun is setting, let’s get going. We were now walking a lot more than we were talking and we all started to fall into our own mental game of endurance. Just one foot in front of the other. The setting sun only made the orange red glow on the mountains more intense. 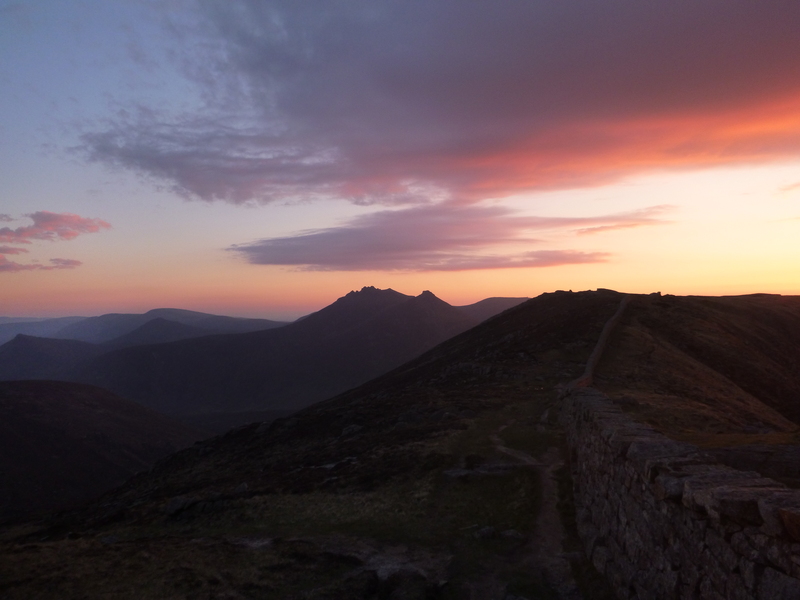 The colours were wonderful and I personally thought it was some of the best views I had ever seen of the Mournes. We had to push on because soon there would be no view to sit and admire in the dark. The trudge up Slieve Commedagh was a tough one, simply because of tired legs, and it soon became a mind over matter situation, where you didn’t think about walking, you simply did it. Another reason you didn’t think about walking because this is when the sun was setting, and casting a spectrum of colours across the sky, it was simply sublime. Along with this feeling of awe at the landscape around us came the feeling of being alone and the realization that we could be the only people for many miles around. I feel that this spurred us on even more so than the simple want to complete the route. Spending a night outdoors is an amazing experience, but when you are out without sleeping equipment and are facing exhaustion, the idea becomes more of a nightmare than a dream. 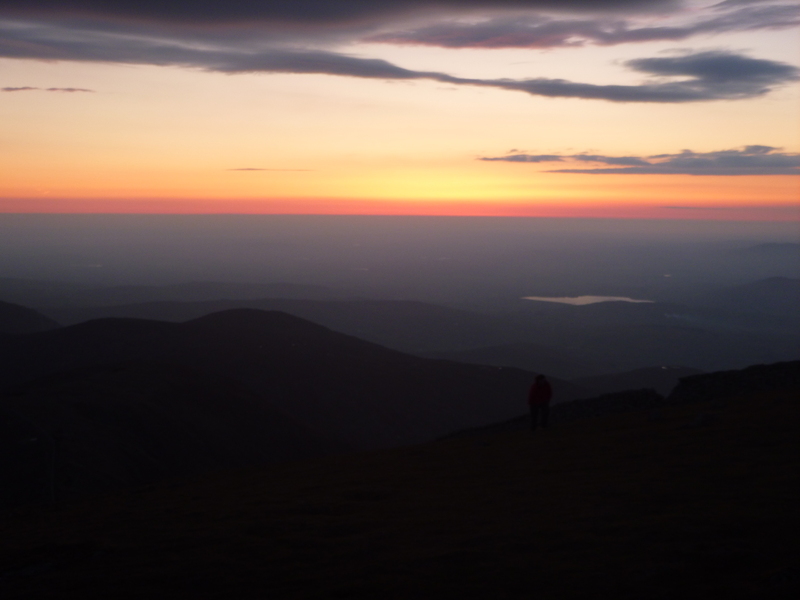 We descended Slieve Commedagh as the light and heat slowly faded away. 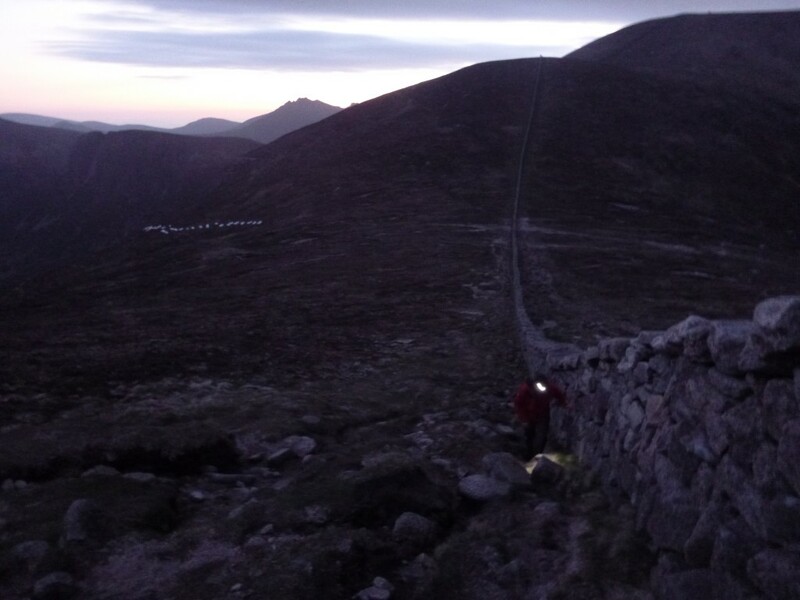 We brought out headtorches and walked in artificial light to the top of Slieve Donard. 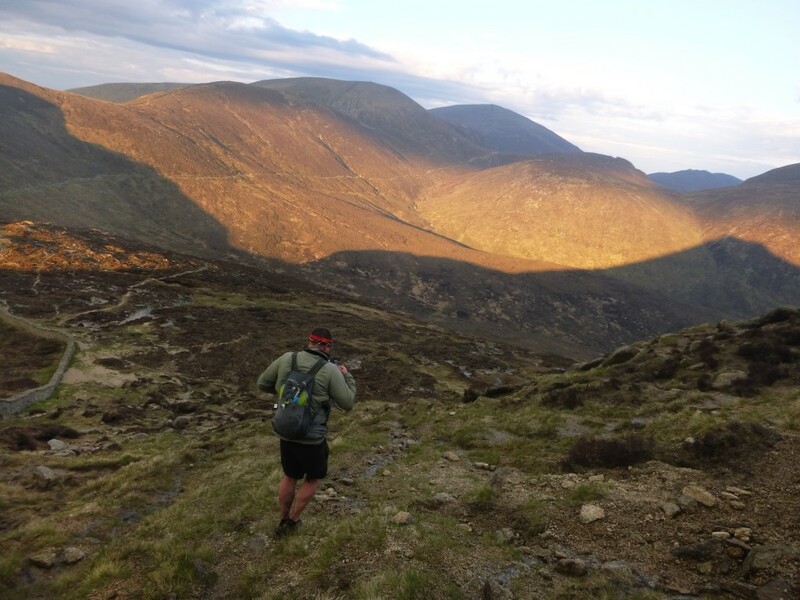 This was it, one last big push up the highest mountain in Northern Ireland, and then we would be home and dry… If only. Slieve Donard was a long slow ascent and sadly we were fooled by its false summits, which was taken slightly bitterly at the time. Eventually we got to it’s summit and straight away started the descent. Personally I didn’t expect to feel so un-amused to reach the summit. 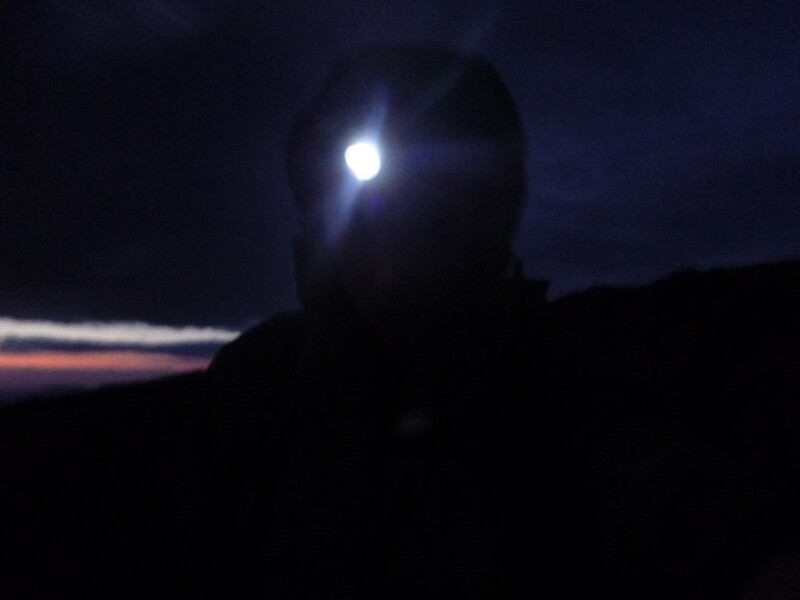 It was nothing to do with the mountain, but more a combination of the time of day or should I say night, and fatigue from previous miles. At this stage I think we all just wanted to get it finished. After descending Donard in the beams of our headtorch we reached the Bog of Donard and were overwhelmed by the fact that our feet faced the chance of once more getting wet, they were just starting to dry! After what felt like endlessly walking in the dark, we didn’t even know that we were passing Chimney Rock and Rocky Mountain as we went. We underestimate the distance from the bottom of Donard back to the car park and Carricklittle and found ourselves disappointed that we had still got miles to go. All we could simply do was to walk, and then walk some more until we arrived back. We walked along lanes and beside fields, and spotted lots of sheep and cattle when their eyes reflected back at us from the light of our headtorch. We eventually made it back to the carpark at a time of 2am. Exhausted and sunburned we had finally made it. The sheer scale of the challenge didn’t really hit us until the next day when we had realised just how much we had done. Even though it took us a few days to walk properly again, we all thoroughly enjoyed it! No finish line photo on this one. In fact the only time we celebrated with a group shot was on our first summit! 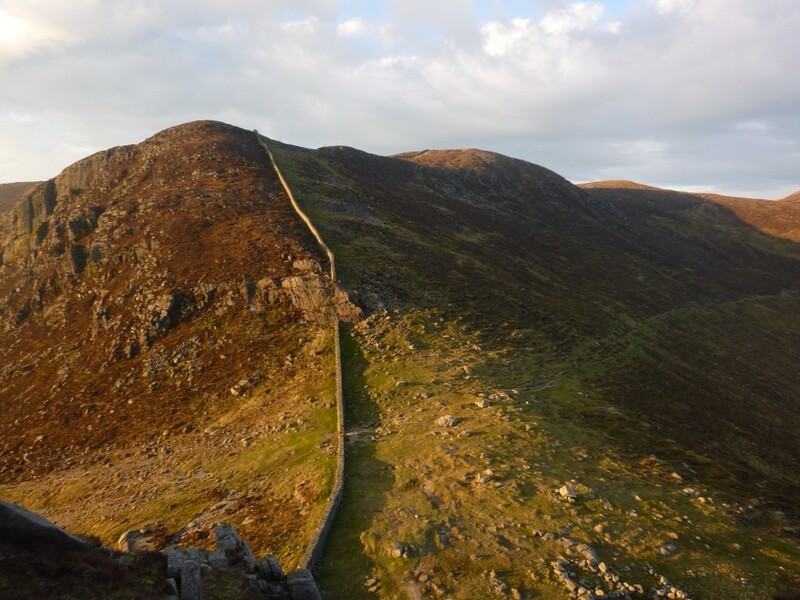 Please do tell us your experiences of walking the Mourne Wall, or ask us any questions in the comments below. Another fantastic well written article given great insight into your trek. Great writeup! Captured the essence of the struggle ordeal walk. Good work guys. Definately looks like a tough day out. I'm hoping to try this over the next 8 weeks at some stage. Thanks for the write up. That was tight: I'm still scratching my head as to why it was so tough: I did 3 Marathons last year and a load of hard days in the Hills but it still strikes me as one of the hardest things I've done in a day. Well done to all involved. Hi. Thanks to u I collect people on this trip like urs. For two nights. But we have problem: where we can leave the cars? Could u tell me or give to me any sugetions? PS. Lovely fotos and great idea!!! The most common place to leave your car is in the Carricklittle Car Park, which is 5 minutes walk away from the start of the route. The car park is situated at a crossroads on the Head Road. Address (for Sat-Nav): Head Road, Annalong, Newry BT34 4RW, UK). Just one questions more; Any costs for parking? I will inform you with pleasure, if our trip will take place. Hi, I want to do the wall for the first time (next year) over 2 days - not as a time challenge but to have the wall as a guide and to pace myself...in your wonderful photos there seem to be a number of walls going off in various directions. How do you know which ones to take? Cheers! Hi Rae, there are other smaller walls which lead off in various directions however you don't need to worry about this. The main wall is prominent and the pathways beside it are well worn which is a great indicator that you're going in the right direction. Other than that, just look out for the wall going up the biggest mountains you can see and you'll have no problem following it - it's a great navigational tool!